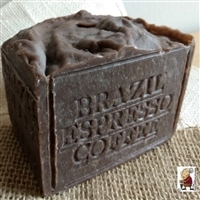 Our coffee soaps have an extended curing process to provide a more luxury and creamy bar of soap. Coffee - rich in antioxidants, tones skin, skin friendly pH, smooths skin ,Coffee Soap Reduce under-eye puffiness - While it may not get rid of those dark circles under your eyes (which are often hereditary), the anti-inflammatory properties of caffeine in coffee help minimize under-eye redness and inflammation. It also helps prevent the build-up of blood under your eyes which contributes to those dark circles. You may discover it as an ingredient in many eye creams.Coffee soap absorb odors - When we cook, our hands absorb the unpleasant odors of pungent foods like garlic, onion, hot peppers, fish, etc. Keep this delightful natural soap on hand in your kitchen! It will remove all of these, and other, nasty odors from your skin. 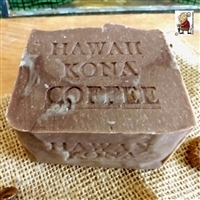 Luxury Coffee Scrub Soap Limited Edition -Large Bar 12 oz.